Paul McCartney stood there, on May 3, 1976, at Tarrant County Convention Hall in Fort Worth, soaking in a pre-show standing ovation that lasted for five minutes, for 10 – and then for 15. He hadn't played a concert in the U.S. in a decade, since the Beatles' last tour in 1966. In the meantime, he'd founded Wings, a new band featuring his wife, Linda, and scored four solo U.S. No. 1 albums and four chart-topping songs. But Fort Worth was more than simply a validation for all he'd accomplished since. On this night, Paul McCartney reconquered America. "Nerve-wracking," is how he described it years later. "This was big-time American media: 'The Beatle returns. What’s he going to be like?' You want to throw up. But you get on there and you suddenly see, these are your people, this is okay. You’re home." By the end of the week, Wings were receiving rave notices for a two-night stand at Madison Square Garden. By the end of the month, he'd made the cover of Time magazine, complete with a specially commissioned illustration by Peter Max. 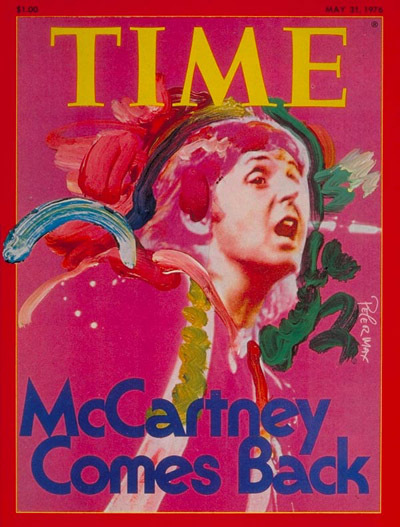 The headline: "McCartney Comes Back." But first they'd have to power through the first show. Wings arrived in Texas having undergone multiple lineup changes since the band's founding in 1972. Denny Laine, former co-founding member of the Moody Blues, was the only other constant besides Paul and Linda McCartney. They'd finally stabilized with a fourth edition featuring guitarist Jimmy McCulloch and Joe English. This group had already delivered 1975's smash Venus and Mars by then, and 1976's Wings at the Speed of Sound – released just weeks before – would follow it to the top of the Billboard charts. That left them with one goal. Before 1976, Wings had been a constant presence on the road, but only in Europe, the U.K. and Australia. "We've got to do America to prove we can do it," Linda once told Hunter Davies. That's why the 21-city U.S. leg of the world tour boasted a set list loaded with tracks from Wings' new hit albums. Other than a few Beatles songs, the focus was squarely on McCartney's most recent material. Still, they could never quite escape the shadow of McCartney's earlier successes, even in a rave review for this opening-night performance. "It was a far superior concert to any show the Beatles ever did," The Dallas Morning News said, "and so much better than any previous concert by [George] Harrison, [Ringo] Starr, and [John] Lennon, they should not even be in the same category." McCartney was so serious in his aim to create a new band dynamic that he'd struggled with the idea of including any Beatles tracks at all, before ultimately relenting. He settled on "Lady Madonna," "The Long and Winding Road," "I've Just Seen a Face," "Blackbird" and "Yesterday" – five old favorites in a set that was typically 30 songs long. "You think, well, they're great tunes -- I like the tunes," he said back then. "When we played them we'd get a bit nostalgic, think, 'Oh, this is nice, isn't it?' So I just decided in the end, this wasn't such a big deal. I'd do them." The rest of the set was dominated by more current Wings fare like "Jet," "Live and Let Die," "My Love," "Listen to What the Man Said" and "Let 'Em In," among others. McCartney did, however, turn to a couple of figures from his rock-star past in putting together the concert. Sound was provided by Showco, after McCartney attended a well-managed appearance at the 35,000-seat Earls Court in London by their clients Led Zeppelin. (Notable touches included monitors hung from beams above the stage, and a Plexiglass stage that could be illuminated from below.) Wings also brought along a laser machine that had most recently been employed at concerts by the Who. It all combined for a media-intense Fort Worth show that The New York Times hailed as "impressively polished yet vital" and "harder-edged" than expected. "Paul McCartney has proved that he could make it on his own," Newsweek declared. After that, it got easier. "As the tour went on, we were used to it then," Laine admitted. "But the very first night was an amazing experience."